How did a small group of soldiers from the Devonshire Regiment find themselves in the dense and dangerous jungles of Burma in February 1943? There follows below a very short description of the personalities and events that when combined, led to this group becoming part of the first Chindit operation. The 13th Battalion, the King’s Liverpool Regiment was originally formed in Scotland in the early 1940s. Their number was made up of the workingmen of Liverpool, Manchester and Glasgow. Mostly in their late twenties, or mid-thirties these men were trained to perform coastal defence duties along the eastern side of the British Isles (ironically in much the same areas as 9th Devonshire bases like Rayleigh in Essex). The first twist of fate to befall the King’s Battalion were the orders to form fresh garrison troops, required to help quell the civil unrest emerging in India in 1941. At the same point in time, a General called Orde Wingate was trying to persuade the powers that be in India that some kind of positive action was needed against the Japanese. His idea was to place troops behind enemy lines in Burma, and for these to create havoc amongst the Japanese, blowing up their railways and destroying their lines of communication. So it was then that the King’s Battalion became part of the 77th Indian Infantry Brigade in 1942, and began their jungle craft training in the Central Provinces of India. The soldiers were trained near the town of Saugor, walking many hard miles each day in the surrounding scrubland and hills. Here they learned to live off the land, how to search out water, and generally make the jungle their friend and home. This took its toll on some and by the late summer of 1942 there was a need for reinforcements to fill gaps in the 3000 strong brigade, as it prepared for the first Chindit operation, code-named ‘Operation Longcloth". 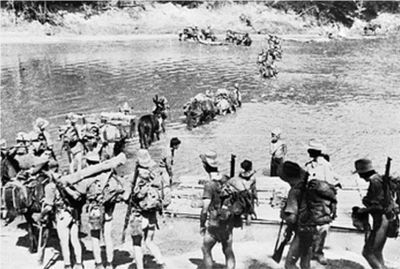 And this is how a party of men from the Devonshire Regiment came to join the Chindits in the Achband Forest, India on the 26th September 1942. The roll of soldiers included in the 77th Indian Infantry Brigade shows that the Devonshire Regiment's draft numbers were 5608001 through 5662000, and included men from the 1st, 6th and 9th Battalions. These men supplemented the already established Chindit columns and had to find their feet quickly as the operation date of early February loomed large on the Burmese horizon. One of these men was my Grandfather, Arthur Leslie Howney, an interior decorator in his mid-thirties from Hampstead, North London. The information that follows shows the Devonshire Regiment men who can be confirmed as 13th King’s. This is based on the information received from several books on the operation, and the Commonwealth War Graves Commission Roll of Honour. It also takes information from Battalion War Diaries from both the King’s and the 9th Devons and the Roster Rolls of Rangoon Jail 1942-45.